When you’re short on time, it can be tempting to use the same social media copy on all of your social media platforms. After all, if you do this, you can set up just one post in your social media scheduler and have it spit out your post to multiple platforms automatically. Sounds great, right? But here’s the thing: Using the same social media copy on all of your social platforms may save you time. But there’s a good chance that it’ll also cost you impressions, engagement, and clicks. Because even if the same members of your audience are on multiple social platforms, they use those platforms in different ways. And let’s not forget that whereas Instagram lets you post your selfie with a caption the length of a novel, Twitter forces you to keep your posts concise. So how do you know what kind of copy to write for Facebook vs. Instagram or Twitter vs. Pinterest? 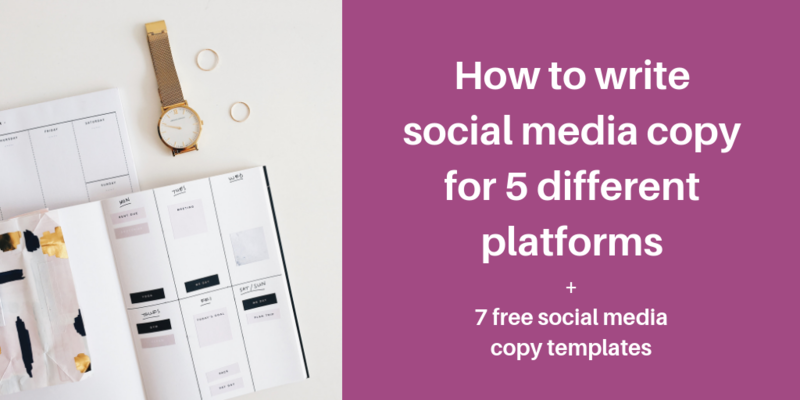 Keep reading below to learn how to write effective social media copy for 5 different social platforms. Need help writing social media posts that generate clicks, email subscriptions, and sales? 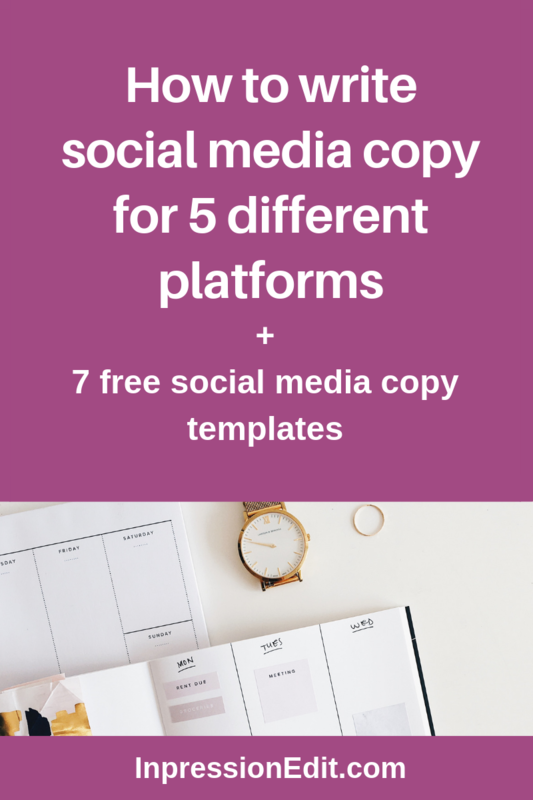 Download my 7 free social media copy templates + examples. With more users than any other social media platform, Facebook is a great place to share news and other engaging content. In fact, 76% of people visit Facebook to find interesting external content, such as blog posts, news articles, and videos. However, whether you’re promoting your own external content or sharing curated content, don’t just share the link. Be sure to accompany it with strong social media copy. Use this copy to introduce the content, express a reaction to it, or quote a key point from it. And be sure to communicate why your audience should click on it. What does strong social media copy look like on Facebook? Although Facebook will allow you to write long posts, keep your Facebook social media copy brief. After all, people generally don’t visit Facebook to read long-form content. And there’s even data to show that Facebook posts get 66% higher engagement when they contain 80 characters or fewer. Hashtags and @mentions aren’t popular on Facebook, so avoid including them in your Facebook copy. 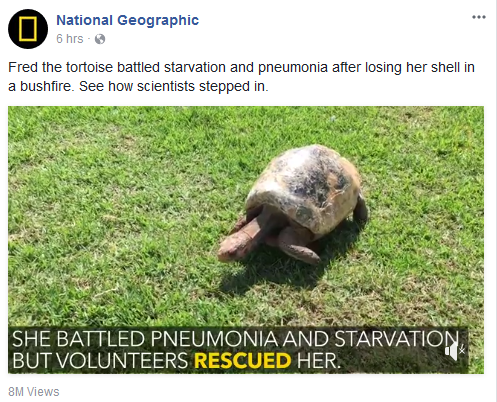 Example: National Geographic invokes curiosity in this caption to provide context for its video. A highly visual platform, Instagram is the top social media platform for sharing images and short videos. Although it tends to work best for strongly visual brands, you can use it to share content for any type of brand as long as you’re willing to exercise some creativity. For example, to promote my copywriting and content marketing blog posts on Instagram, I share the feature images for the posts. Even though Instagram is a highly visual platform, it’s still important to have solid captions for each post. Just like with links on Facebook, it’s important to provide context for the images you share. How do you write solid Instagram social media copy? Focus on writing brief, engaging captions. Although Instagram captions have a generous character limit, any text after the first 3 lines gets cut off. That’s why I recommend placing your most important info, including your call to action, within these first 3 lines. Hashtags, @mentions, and emojis are all popular on Instagram. But unless they’re central to your key message, save them for the end of your caption. Looking for more? Read my full post on how to write Instagram captions that convert. 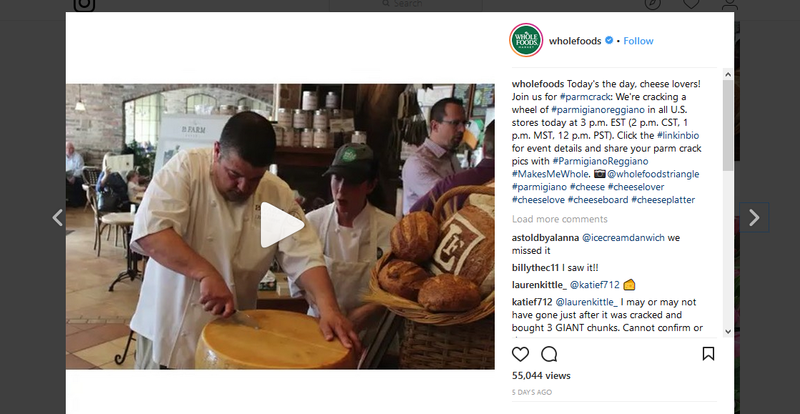 Example: Take a look at how Whole Foods places a call to action (“Join us for #parmcrack”) close to the beginning of this caption. When it comes to writing social media copy on Twitter, it’s important to be brief. That’s because the character limit for posts is 140–240 characters depending on your account. On Twitter, hashtags and @mentions aren’t just popular. They can be effective ways to get your key message across concisely. They also help you boost the visibility of your posts and connect with other users. However, don’t go crazy with the hashtags. Data shows that posts with 1–2 hashtags receive 21% more engagement than posts with 3 or more hashtags do. And like with Facebook, if you use Twitter to share a link or image, write social media copy that provides context for it. Example: The Food Network uses the copy and hashtag in this post to communicate the value of its linked recipes. It’s time to talk about how to write social media copy for my favourite platform: Pinterest! If you’ve never experimented with Pinterest for your biz or blog, you may think it’s a platform that’s just for wedding planning and meal prep. That’s what I thought too. But then I learned how effective Pinterest is in driving traffic to blogs and websites in a wide range of niches, even ones that aren’t inherently visual. And when I gave it a try for my copywriting and content writing brand, it increased my email subscribers by a whopping 1018%! To get the best results possible in Pinterest, you can’t focus just on designing swoonworthy pins. You also need to write optimized descriptions for them. Pin descriptions don’t just tell your audience what your pins are about. 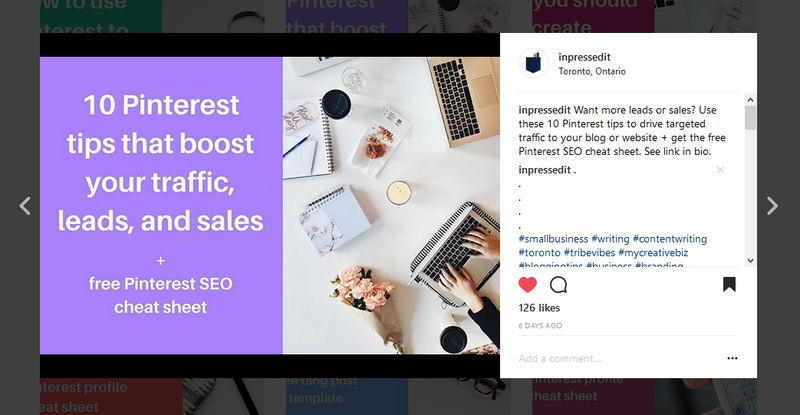 They also improve your Pinterest SEO by telling Pinterest what your pin is about so that Pinterest displays it as a result when people search for relevant topics on the platform. Although hashtags weren’t popular on Pinterest in the past, they are now. That’s why it’s strategic to include no more than 20 hashtags in your pin descriptions. 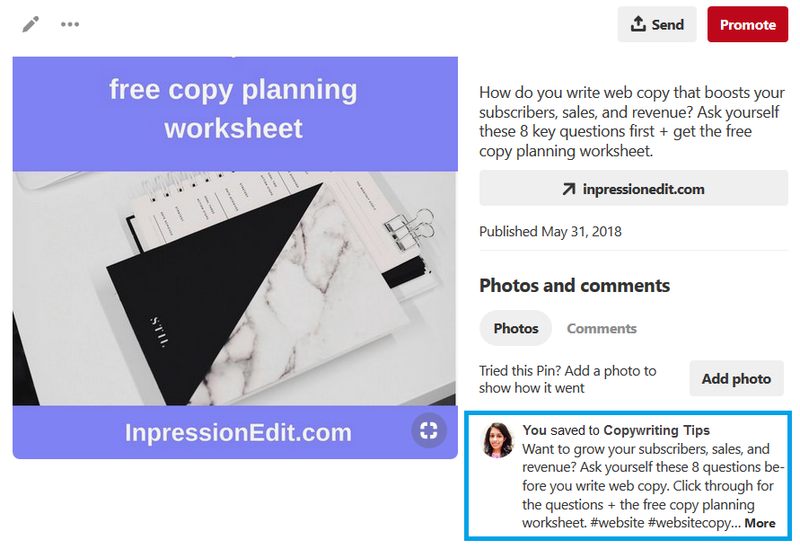 When writing social media copy for Pinterest, weave your hashtags into your copy or list them at the end of your pin description. Want to learn more about how to write solid descriptions for your pins? Read my blog post on how to write optimized Pinterest pin descriptions. Example: Check out the conversational, keyword-rich description I wrote for this Pinterest pin. Most people define LinkedIn as the professional social media platform. But there’s something else that sets LinkedIn apart from the other platforms on this list: In addition to sharing standard social posts, you can also share long-form content on LinkedIn Pulse, LinkedIn’s content distribution platform. When writing social media copy for standard posts, keep it brief. Even though you have 600 characters to play with, your audience of busy professionals may not have the time to read all of them. If you’re sharing a link to an industry article or other relevant content, be sure to include copy that concisely provides context and explains the value of the linked content. If you decide to publish content on LinkedIn Pulse, communicate clearly, get straight to the point, write a magnetic headline, and share a thought-provoking idea or actionable insight. Remember that because your audience is busy and pressed for time, it’s essential to make reading your content worthwhile. You can encourage clicks to your blog or website by sharing an abbreviated form of your content on LinkedIn Pulse and emphasizing the value users will find if they click through. 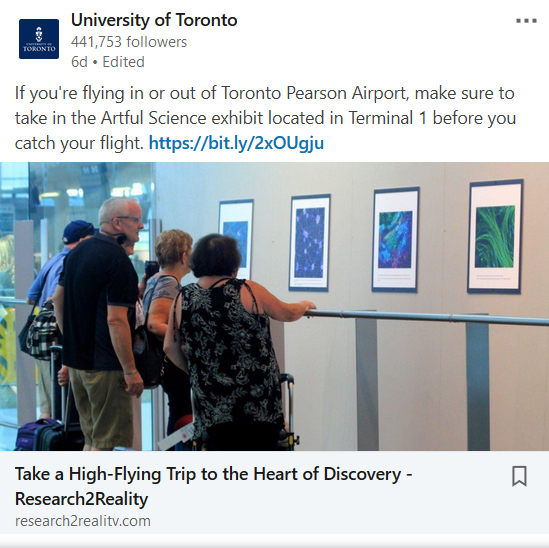 Example: In this standard post, the University of Toronto briefly explains why you should click on the link in its post. It’s always great to repurpose content when you can. But when it comes to sharing content on multiple social media platforms, don’t use the same social media copy on each one. Instead, tailor your social media copy and captions to the characteristics and user behaviour of each platform. This will help you craft social media posts that resonate with your audience on each platform, engage them, and encourage them to convert.